Bramble Rose sat at the table in the cafe, sipping a cup of mint tea, then taking a small bite of his clover danish. While he looked calm and collected, his stomach was churning with butterflies. He was going to see Foxxy again! Ah, Foxxy. Back in high school, when he'd had his goth phase, he'd had such a giant giant crush on her. Then there'd been that little problem with Black Mesh, and all the drama around that, and he'd just stopped going to the goth meetups. They'd tried a few more times to go out visiting old abandoned Canterlot buildings, but school had started, and then ... they'd just drifted apart. Still, it was amazing how old emotions resurfaced when he'd heard from a friend of a friend that she was looking for someone to guide her into the Everfree Forest. He was dressed in a simple dark green vest that nicely complimented his lavendar coat, and came with a lot of very useful pockets. He had his long, long silver mane all bound up into a tight braid that he had gathered up behind his head. He wondered what she'd think of all that hair. Last she'd seen him, it'd still been pretty short - well, it'd been a mess. Not the hacked-off barely-there cut when she'd first met him, but not fully grown out yet, either. And he'd still been dying that black streak to it. What would she think? At least she was meeting him now that his career was finally taking off. A research project in the Tirak waste. No more delivering flowers and modeling stallionwear for catalogs and advertisements, no more serving drinks or other small, odd jobs to get by and scraping up the bits for self-driven research. He was a real, honest-to-goodness scholar and researcher, now. That'd impress her ... right? Augh, why did he care? It'd been ages! They'd never even been dating in the first place! It'd been an unrequited crush, and she probably met somepony else in the meanwhile! He dropped his head to the table. Why was he such an idiot? This was about research! Whatever research she wanted to do in the Everfree! That was all! Ponyville again, such a lovely and eccentric town this was. The last time she was here she'd been turned into a filly and had been looked after by a handsome, somewhat roguish stallion tattoos along with several other victims of the same circumstances caused by the town's princess. Now she was here again for another magical adventure... and to make things even better she found out one of her old friends from Canterlot was experienced with the magical nature and mysteries of the Everfree Forest! Hearing that this former classmate was none other than her old friend Bramble rose was icing on the cake, this was going to be so much fun! As soon as she'd set hoof in the shop her eyes rested upon the purple pony in the dark green vest. "Ohhh... he's grown his mane out!" was one of the first thoughts that popped into her head. When bramble took a moment to look over the cafe's menu, he'd find his friend had still not lost that signature stealth entrance of hers. As soon as he looked back up he'd find a hoof soon met his nose... a recurring greeting that she'd give him back in school. 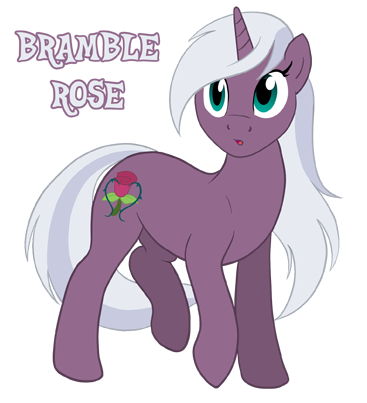 "Nice to see you again, Bramble Rose!" She said in her usual, calm but perky tone. Soon the hoof that met his snout rested on the table as she picked up her menu and laid her umbrella against edge before sitting down with a smile. She hadn't gone with a vary complicated outfit like some of the ornate black dresses she would wear back in school. Today she wore a simple black jacket with a fur trim. "So... I see you've changed your mane...I like it! also... I can't help but notice you look a bit similar to a model I've seen in a few magazines." 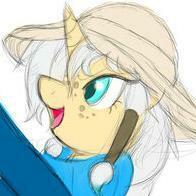 she smiled softly, "Has somepony been doing some additional pursuits besides the academical?" Bramble blinked as he looked up from the menu and there was a hoof right *there* ... then his nose squished lightly under the touch, in that way which just ... weirded him out. "ACK!" he cried, and automatically his hooves came up to rubrubRUBrubRUBrubRUBRUBrubRUB over his nose in swift little gestures, getting rid of that weird feeling of squishiness. Then he caught himself, and brought himself up straight, instead taking a napkin and dabbing lightly at his nose. His show of polite society was marred by the strong blush in his cheeks at having been caught unawares and made to look so silly. "Foxy!" he said blandly, "Haven't had somepony do *that* for quite a few years." He nodded to her amicably. OK, so it's been a few years. no enthusiastic hug of greeting, though, that was all right. She'd always been reserved, except for that bizarre habit she had of needing to touch his nose every time she saw him. But then her questions made his already pinkened cheeks flame scarlet. "Oh! Oh, you ... you saw those! Ah-heh. Yes, well. There were a few years between graduating and getting my first grant where I needed whatever bits I could summon to do my research. And I did want to try for at least a few years to do things without depending on my mother. Now, though - I do happen to have a grant, from Princess Twilight, to go study the blasted area from the battle between her and Tirac. And you? What have you been up to?" Yep, this was Bramble Rose alright! he even still did that over-exaggerated nose rubbing thing he did back in Canterlot High. The mare smiled innocently at the stallion once he took that bland tone with her, "I guess I'll just have to make up for lost time then." She said, sticking her tongue out mischievously across the table. "Gotta say, You looked pretty good in those outfits. I was a bit sad you stopped, but I'm glad you found a way to get a bit of independence!" The mare took a book out of her saddlebag, "I've been traveling mostly, visiting various supernatural hot-spots over Equestria and beyond to find inspiration for my novels... I'm being told I'm selling almost as much as J.K. Yearling." The last bit she stated with a hint of pride in her voice as she slipped the book back in. 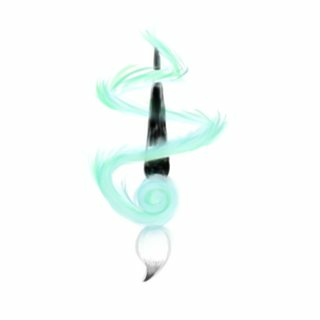 "Apparently I was asleep in my retreat when tirek stole my magic... so... I wound up missing out on that whole debacle but it looked like it all worked out as usual." Bramble Rose let out a faint little groan in the back of his throat. What did she find so fascinating about ponies' noses? Thank goodness there were no photos of 'Silk Scarf'. Or were there? He didn't know. Oh no. Still ... he ... looked good? He felt his face heating up and his brain shorting out as he tried to think of a polite response. "They're not all out yet!" he ended up blurting. "there's still a few more yet to publish! So ... uh ... it's ... nothing big. I mean, it's just shots in a catalog. I heard something about a fashion magazine. I don't really pay attention to those..."
He groaned at having even mentioned it. Change topic, change topic... "Ah, yes, your books! I have been collecting them. I'll have to have you come by and sign a few! I'm so impressed that my childhood friend has gone on to be such a big author!" He let out a soft 'ummm' and then said, "I don't know why I asked what you've been up to. I mean. I know what you've been up to. But ... more ... immediate. But yeah, the books are amazing! Your poetry is better than it has ever been! I'm always there in line the first day, every time." Foxglove was momentarily caught off guard by Bramble's sudden outburst, her eyes widening before she let out another of her calm chuckles. "Well..." She began, "I'll look forward ta seein' the rest of 'em then!" A smile creased the ivory coated mare's lips while bramble gushed for a moment about her books. It was strangely sweet and heartwarming to have a friend praising her work after so long an absence from his company. "Look at you, Brambles. All grown up and making me blush! Once we finish up what we're plannin' I promise I'll sign each and every one of those copies just for you." The mare looked over her menu and smiled brightly, "Hmm... Before we head out on our business." she held up the desert menu, the tip of her other hoof pointing to the milkshake menu. "Wanna share a shake like back in school?" Bramble felt his face growing quite hot indeed. Making her blush? Ah-heh. She didn't look like she was blushing! She looked elegant and refined, as always. he was *supposed* to be that way. His mother had taught him to always keep his cool. Why did talking to mares always get him so flustered? Especialy Foxglove! "Ah, well, milkshakes! Heh. Wooo... you know, heh, funny story there," he said, rubbing his hoof at the back of his neck. "I used to carry two bit pouches back in high school. One with most of my bits, and the other with enough for one milkshake but not for two. Just so I could pull it out and say I didn't have enough. See, ummm..." He coughed a little bit, "I might have had a little bit of a crush on you in high school. It was kinda just a trick to be close to you. I'm sure we can both afford our own milkshakes, now! 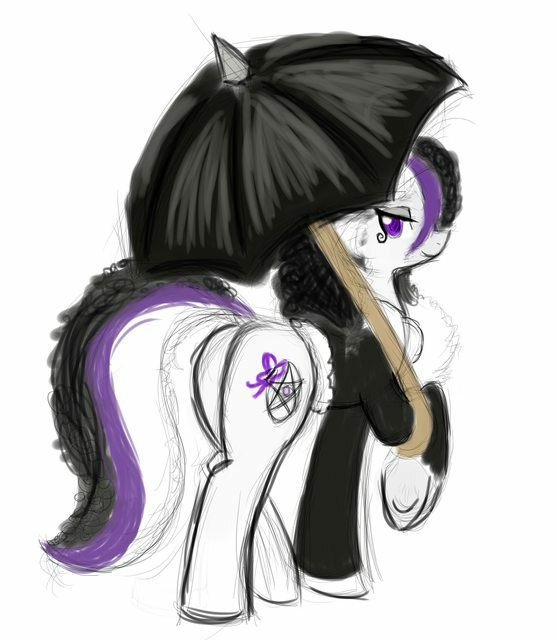 I wouldn't want to try to trick you into something like that anymore, that wouldn't be nice... or fair ... "
The ivory mare gave him a rather flat look for a moment before she arched her brow and smiled at him almost deviously, "Well... someone's got a bit of a scoundrel in him." She teased before raising up a hoof to get a waiter's attention. " Excuse me, Miss, how large do the milkshakes come here?" The mare answered with a response that the largest size was about as tall a head. Foxglove glanced to the stallion across from her and before he could interject, "We'll be sharing one large one." The waitress nodded and made her way to the kitchen but came right back to ask how many straws, "Surprise us." "Well then... in return for not telling me that back then. You're going to have to share this one with me." The mare put up her muzzle in a haughty manner before smiling back at the stallion across from her, "... and maybe a few more in the future. "